(NaturalNews) To hear it from proponents of the vaccine industry, vaccines are based on rock-solid science that proves them to be completely safe and widely effective. These beliefs, however, are not factually based on real science but rather a persistent vaccine mythology that has been propagandized by the vaccine industry, medical practitioners and even governments which underwrite vaccine risks. 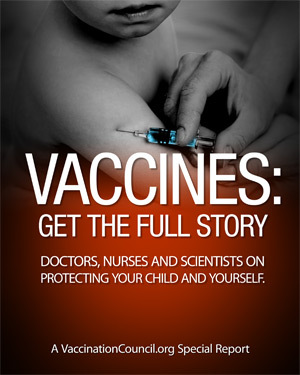 This groundbreaking document, called Vaccines: Get the Full Story, is available as a free download from NaturalNews.com. Click the report cover image to go directly to the download page, where you’ll find downloads available in 9 languages, including Spanish, French, Hebrew and Russian. The vaccine industry’s message is like a broken record: Vaccines are “safe and effective,” they say. But repeating a lie over and over again does not magically make it true. Any such declaration of vaccine safety or effectiveness must be based on actual scientific inquiry, and the real science is utterly lacking on vaccines. Did you know, for example, that MMR and seasonal flu vaccines have never been clinically tested against non-vaccinated individuals? • A list of the many MDs, PhDs, NDs and other medical professionals who are signing onto this document and taking a stand to critically question the myth that vaccines are proven to be both safe and effective. • The profit motivation behind the pharmaceutical industry’s persistent vaccine push. • The shocking truth about what’s used to make vaccines (aborted fetal tissue, 59 different chemicals, DNA from diseased animals and more). • An overview of some of the most dangerous vaccine ingredients, including aluminum and formaldehyde. • The truth about conflicts of interest in the vaccine community and why doctors profit from vaccination policies. • Why vaccinated children have far worse health outcomes than unvaccinated children (and why the vaccine industry refuses to test vaccines against the long-term health outcomes of unvaccinated children). • How to opt out of “mandatory” vaccines. • Important advice for parents about how to protect the health of your children while saying NO to vaccines. • Online resources for learning more about the dangers of vaccines. • A list of recommended reading materials for further education. This report by the International Medical Council on Vaccination (www.VaccinationCouncil.org) is an absolute must-read for parents everywhere. It describes little-known facts about vaccines, children and immune health that the vaccine manufacturers and government health authorities don’t want circulated. Whether or not you choose to vaccinate yourself or your children, you owe it to yourself to hear both side of the story before making a decision, and this report tells you the side of the story that your doctor probably doesn’t know and your government absolutely does not want you to hear. That’s because governments underwrite vaccine risk through their government compensation programs. Thus, it is in the interests of governments that vaccines never be shown to cause harm. This is causing the vaccine industry to react with a sense of desperation. That’s why the British Medical Journal (BMJ) has resorted to using articles written by a blogger named Brian Deer to spread factually false accusations about some of the top medical specialists in the world who are legitimately questioning the safety of vaccines (such as Dr Andrew Wakefield). Unquestioning obedience to conventional vaccine mythology is so central to the ongoing profitability of the pharmaceutical industry that vaccine manufacturers will resort to practically anything to protect their turf and try to silence anyone who questions what can only be called a dogmatic delusion of vaccine safety and effectiveness. • Vaccines are almost never scientifically tested in randomized, double-blind, placebo-controlled studies using proper placebos such as saline solution. Instead, the industry uses other vaccines as “placebo” in order to try to hide the harm caused by those vaccines. • The viral ingredients that go into vaccines are absolutely horrifying, and they include stealth viruses that are not listed on the label, as well as DNA taken from diseased animals such as cows and monkeys. • The chemicals used in vaccines are known neurotoxins, and they include mercury, aluminum and formaldehyde. The use of these chemical toxins is not even denied by the vaccine industry. Even worse, these chemicals are injected into the body, bypassing the digestive / liver systems that normally help neutralize toxic substances that might be swallowed. This is why statements from vaccine pitchmen like Dr Oz who claim “there’s more mercury in fish than vaccines” are intellectually dishonest and misleading. People don’t inject their children with fish. • The mainstream media has huge conflicts of interest in reporting on vaccines because virtually all media outlets depend on pharmaceutical advertising money to stay financially afloat. This is why popular news personalities like Anderson Cooper and George Stephanopoulos wildly discredit themselves when they play the roles of on-air attack dogs targeting people like Dr Andrew Wakefield. Notice how they never disclose their own networks’ financial ties to Big Pharma? • Even governments have huge motivations to make sure MMR vaccines (and other types of vaccines) are never shown to be harmful because they have underwritten vaccine risk through the creation of special funds that pay damages to vaccine victims. If the true risks of vaccines were widely known and acknowledged, the resulting claims from parents of children harmed by vaccines would total in the trillions of dollars. • Speaking of vaccine victims, the United States government routinely admits that vaccines cause autism and other harmful effects in children through its Vaccine Injury Compensation Trust Fund, which has paid out tens of millions of dollars in awards to parents whose children were proven to have been harmed by vaccines. … this story gets much, much deeper. The more you look at the facts, the more you realize the vaccine industry is steeped in conflicts of interest, quack science, profit motivations, corrupt individuals and the complete disregard for the safety of children. The vaccine industry is, effectively, one of the most dangerous examples of modern organized crime. Its actions are profiteering and monopolistic, and it maintains its power through a persisted campaign of intimidation, censorship, financial influence and quack science. Click here to download this report and see for yourself. This is the information the vaccine industry does not want you to read. They don’t even want doctors learning this, because the more doctors begin to investigate this issue, the more they become convinced that they’ve been lied to about the safety and effectiveness of vaccines. “I am absolutely convinced that the MMR triggered my son’s condition, as the first problems with pain occurred on the first evening after the vaccination and the loss of skills happened after also he had been gaining weight at a good rate and after the MMR he only gained 1lb 7ozs in 9 months. I really want to urge you to become a fan of Dr Gary Null (www.GaryNull.com) who is doing the very best investigative journalism on this topic anywhere in the world. His four-hour “deconstruction” of the BMJ, Brian Deer and the barrage of false claims against Wakefield stands as perhaps the single most important investigative piece that has yet been produced on this topic. It makes the BMJ’s own report by Brian Deer look like a late-night tweet from a drunken blogger.